Great news to all Italian football fans out there. Now is your chance to subscribe to a cheaper alternative to watch all the games except for the Napoli home game..heh! With SerieA.tv Pay Per View from 7.95 USD, you can watch the game Live and On Demand. The package includes Condensed Game and HL. Not only that, you can also get the latest news and standings for your favorite teams. 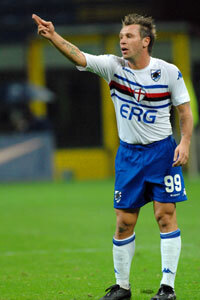 For example, The Sampdoria striker, Antonio Cassano will be out of action for at least two weeks after straining a muscle in his left thigh at the weekend. And if you feel generous for your obsession for football, you can pay for the Season Pass from 109.95 USD and you can watch all games Live and On Demand. This package includes Condensed Games and HL from all games played throughout the whole season. And great news as well since Italian Cup games are included in this SerieA.tv Season Pass. Even for a person like me who doesn’t follow much about football, I think it is considered low cost to pay for high-quality streaming content of exclusive games that is not available legally from any other source. Checking out the standings, it seems that Inter is leading ahead, thanks to Ibrahimovic Zlatan as the top scorer..heh! I guess number 8 is really a lucky number, huh! Oh, for those big fans of AS Roma captain Francesco Totti, the former Italy international is just one goal behind Inter’s hitman Zlatan Ibrahimovic and Juventus goal-king David Trezeguet in the all-time Serie A goalscoring list.